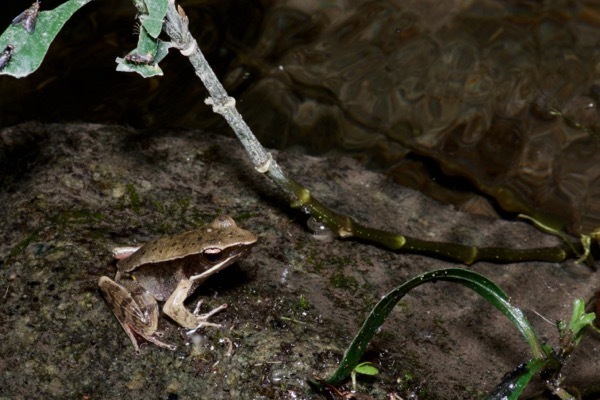 The genus Lithobates was split from Rana by Frost et al in 2006. This has been a controversial change ever since, and many authorities continue to use Rana. 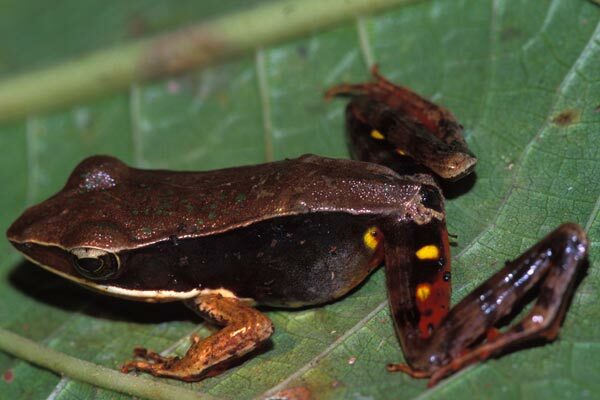 These frogs are forest floor leaf-litter mimics. 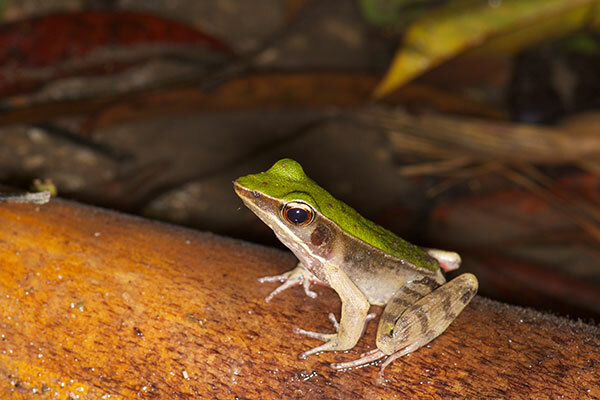 Like many other drab-colored frogs, they have bright "flash colors" hidden on their sides and legs. When the frog suddenly jumps, these bright colors are momentarily visible. This is thought to be an adaptation that can distract predators, buying the frog the instant of extra time it needs to make a getaway. This species seems to have been named after someone named "Warschewitsch". I don't know why the ch turned into a z in the scientific name accepted today. 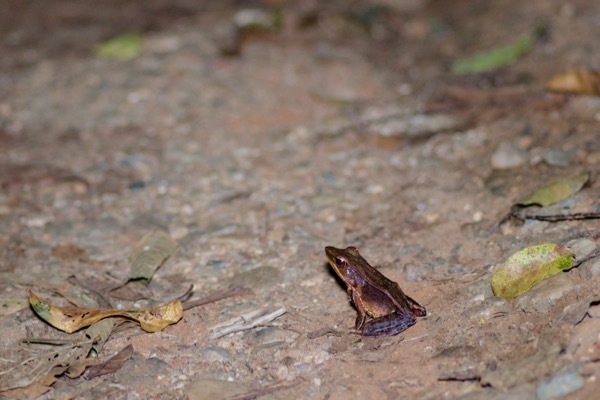 These frogs were photographed on a herping trip with GreenTracks. Here is a complete list of the species we found on this GreenTracks trip. 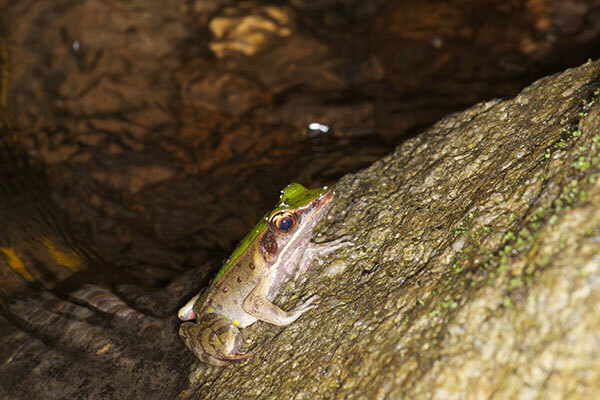 These snazzy frogs were the most numerous species at night along a stream behind Hotel Campestre. I had seen them in the late afternoon also, but at that time they were extremely wary and would leap into the stream when I got anywhere near. At night some of them allowed a very close approach. Some had brown backs like the one I had seen earlier in Costa Rica, and others such as these had bright green backs. In the same spot a couple of years later, we saw a few more individuals of this distinctive frog species. This one didn't seem so brilliant, what with all the tasty flies in the leaves just above it. On the abnormally dry forest trail at Pipeline Road, the pointy snout left no doubt of the identity of this frog, though it did not stick around for a close-up.